Megan Powell is a writer who lives in Morton, PA. Her work has appeared or will appear on fiction accepted by Twilight Times, Quantum Muse, The Orphic Chronicle and Easy Writers. She also edits Fables, Leo's Workshop and Meredith. 1998, Ace Books, $22.95 (hardcover) $6.99 (paperback), 448 pp. Ever since I read "The Phantom of Kansas" in a beat-up Year's Best SF anthology, John Varley has been one of my favorite authors. He's dealt with major scientific, social and cultural ideas in a matter-of-fact way; no matter how incredible the background, he's just telling a story. 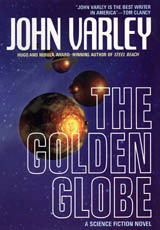 The Golden Globe is part of the Eight Worlds universe. As readers can notice (and as Varley has unabashedly admitted) this universe is not always internally consistent; after all, he's been playing around in it for over two decades. Though it does not quite agree with some details in earlier short stories, The Golden Globe does not contradict the comparatively recent Steel Beach in any way that I noticed. The protagonist of The Golden Globe is Kenneth Valentine, an itinerant actor. We first meet him during a production of Romeo and Juliet; originally cast as Mercutio, he doubles up as Juliet when the actress fails to show. It shortly becomes clear that Valentine has some problems with the law (the nature of the major problem is not revealed until about page 443 -- or the back cover of the book), and that he's quite adept as a con artist and all-around survivor. His luggage is second only to Terry Pratchett's in terms of self-defense capabilities. Unfortunately, Valentine attracts the attention of the Charonese, a particularly nasty breed of criminals, and his previous legal problems begin to pale in comparison. Over the course of the book, we get glimpses into Valentine's childhood (told in third person, in contrast to the first person narration of the rest of the book). We learn that his father John Valentine, in addition to being a fine actor, was emotionally and physically abusive. We learn that Kenneth Valentine was better known as "Sparky", a child star of considerable note. We learn that his friend, Elwood P. Dowd, can't be seen by anyone else. Steel Beach, despite a complex protagonist and significant political events, was primarily a tour of Varley's Luna. In The Golden Globe, the background is just as incredible, but there's not quite the same guided tour flavor. (This makes sense, since the narrator of Steel Beach was a reporter, not an actor.) We see the giant spiders cannibalizing a natural moon to build an artificial satellite. We meet a Little League team of Amish youngsters on Luna. We read reviews of the entertainment industry. We meet bored artificial intelligences with more autonomy than their creators realize. We discover that a bichon frise can become infatuated with a tiger. We learn that hobo culture hasn't changed much; you've just got to be careful about your air supply on interplanetary flights. But despite the background, the focus is on our narrator. Will he succeed in ducking the authorities again? Will he escape the Charonese? Will he get to play Lear? Certainly those questions kept me turning the pages. But the questions about his past were at least as compelling. What happened to the amazingly successful show "Sparky and His Gang"? Why did he originally go on the run? Where is John Valentine? Who or what is Elwood? All of these questions are answered; some of the answers are expected, some are not, but there are no loose ends. Given the amount of material Varley's juggling, that says something. If you're familiar with Varley's writing, you've probably already devoured this book. If you haven't yet had the pleasure, The Golden Globe is a good place to start exploring this universe.